The Dawson family of County Monaghan came from Yorkshire to Ireland during the reign of Elizabeth I, Thomas Dawson becoming a Burgess of Armagh. Subsequently Richard Dawson, a Cromwellian cornet of horse, assembled the nucleus of the family’s estate in the 1650s and 1660s through the acquisition of thirty-one townlands, based around a property called Dawson’s Grove on the banks of a chain of lakes separating counties Cavan and Monaghan. Richard Dawson’s only child, a daughter named Frances, married her cousin Walter Dawson. Their son Richard was an Alderman of Dublin, an MP for County Kilkenny and the owner of a family bank. He further expanded the estates both in County Monaghan and elsewhere. With his wife Elizabeth, daughter of John Vesey, Archbishop of Tuam, he had four children, their third son being Thomas Dawson born in 1725. After coming into his inheritance the latter built a new house at Dawson’s Grove in the early 1770s and also bought and redeveloped a residence in London, Cremorne House, Chelsea where the garden designer Nathaniel Richmond was commissioned to lay out the grounds (although the house is long gone, this is now the site of Cremorne Gardens, just down river from Battersea Bridge). In May 1770 Thomas Dawson was created Baron Dartrey of Dawson’s Grove, and in June 1785 Viscount Cremorne. In August 1754 Thomas Dawson married Lady Anne Fermor, youngest daughter of the first Earl of Pomfret, with whom he had two children before she died in March 1769. Her husband’s grief was considerable, but not so great as to prevent his marrying just over a year later Philadelphia Hannah Freame. She was the granddaughter of William Penn, whose family owned land in County Cork but who is better known as the founder of Pennsylvania. By his second marriage to Hannah Callowhill William Penn had eight children one of whom, Thomas Penn, married Lady Juliana Fermor, eldest daughter of Lord Pomfret. 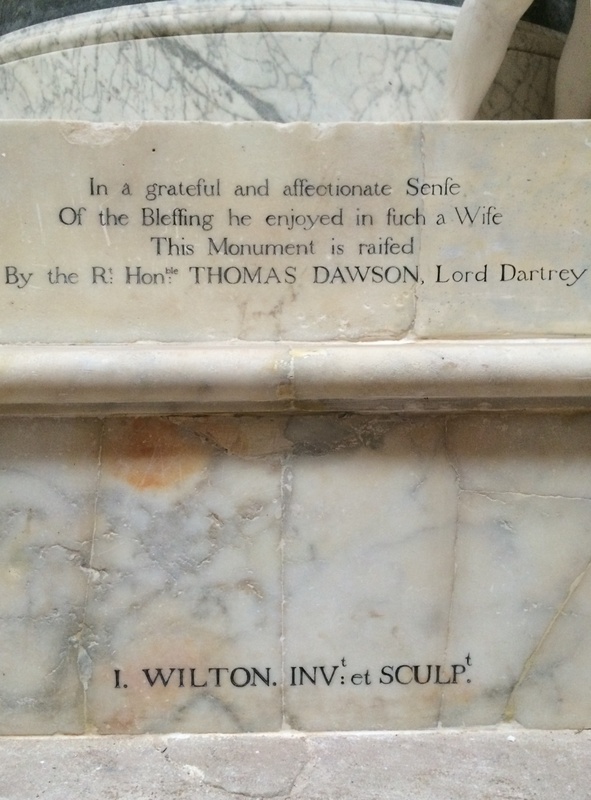 This explains how Thomas Dawson should have met his second wife Philadelphia, whose mother Margaret Freame, was another of William Penn’s children. In other words, he married his first wife’s niece. And, as her name indicates, she was born in the city of Philadelphia in 1740. Philadelphia Freame’s marriage to Thomas Dawson was marked by the building of a house for the Dartrey estate’s agent, Charles Mayne, which was then given the name Freame Mount. Lady Anne Fermor, however, was commemorated in a more original fashion with the construction of a mausoleum which stands in the middle of Black Island on raised ground facing the former site of Dawson’s Grove. Based on a surviving elevation for the west front which shows the inspiration of the Pantheon in Rome, the design of the Dartrey Mausoleum has been attributed to James Wyatt, making it the English architect’s first commission in Ireland and contemporaneous with Wyatt’s Pantheon, the famous assembly rooms on London’s Oxford Street. 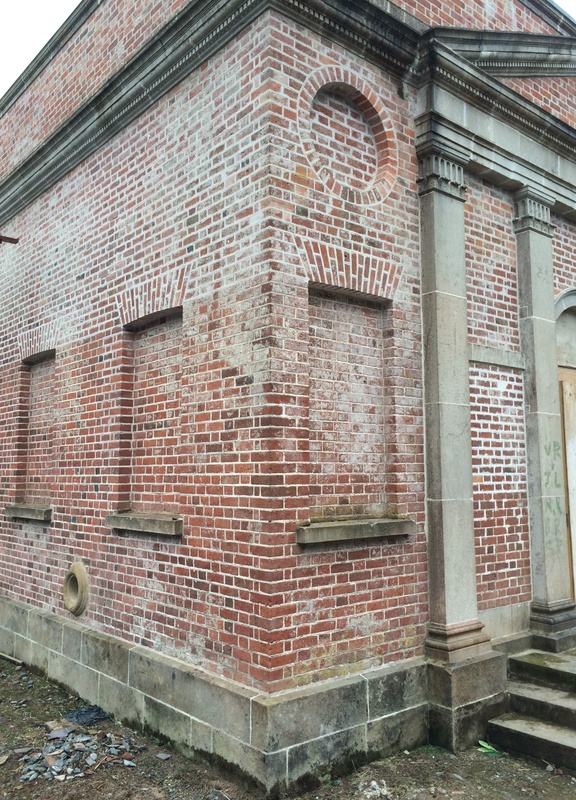 The building in Monaghan is a tall, square block built of locally-fired red brick raised on a limestone plinth. The exterior, featuring a sequence of blind windows and oculi, is relieved on the western front (which would have been visible from Dawson’s Grove) by a shallow tetrastyle portico with four pilasters (note their unusual fluted capitals) beneath a pedimented entablature. Above this cube rises a dome, its open centre providing the only light for the interior which would have been even more dramatic when viewed on nights with a full moon. 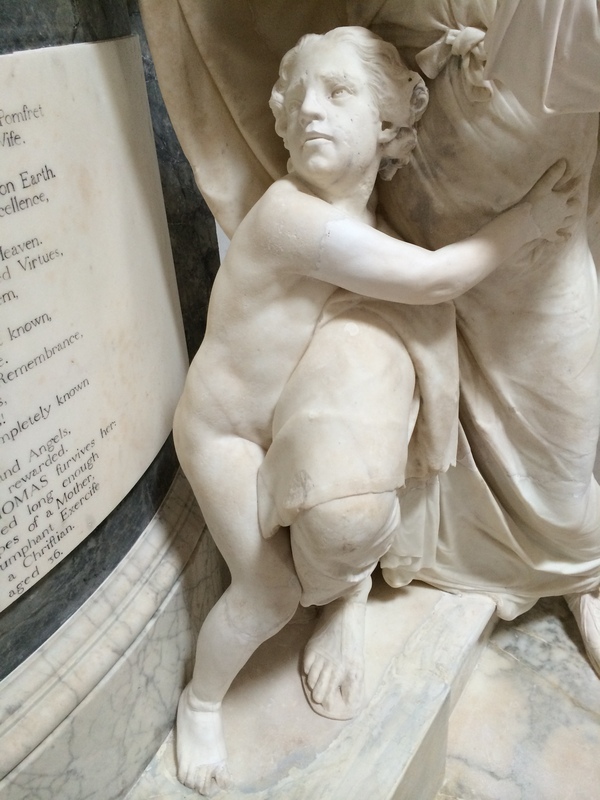 In August 1774 the Dublin Hibernian Journal reported, ‘A few days ago was landed in Dublin a beautiful Marble Monument done by Joseph Wilton, Esq., of Portland Street, London, which Lord Dartrey is to erect in a Temple at his seat in Co. Monaghan, to the memory of his late wife, Lady Anne Dawson, daughter of the late Earl of Pomfret.’ The London-born Wilton, a founder-member of the Royal Academy, had in 1764 been appointed ‘Sculptor to his Majesty’ by George III. 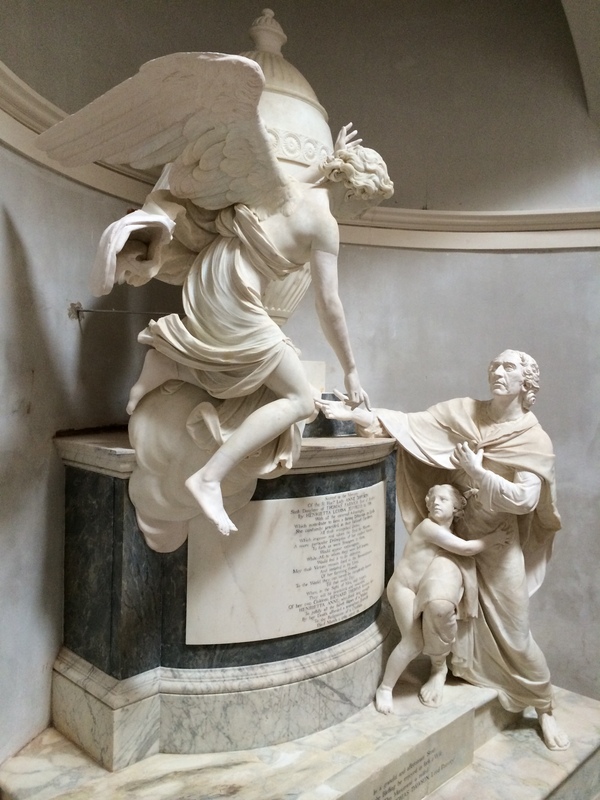 His funerary monument in the Dartrey Mausoleum, for which he was paid 1,000 guineas, is the only commission he received in Ireland; during the same period he also sculpted a bust of Thomas Dawson, now in the Yale Center for British Art. 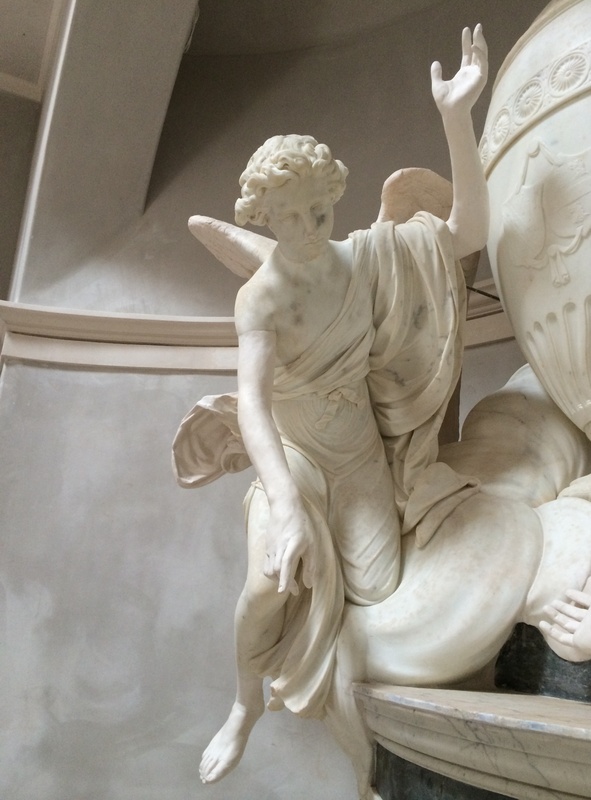 Like that piece, Wilton’s work inside the mausoleum is carved in Carrara marble and was installed against the eastern wall above a plain altar. 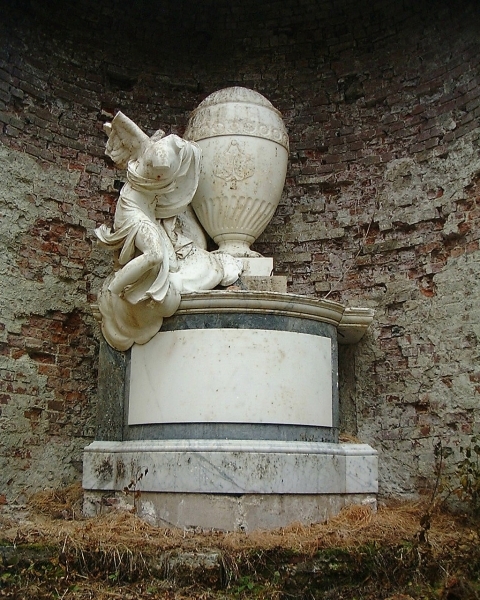 A plaque recalls both Lady Anne, described as possessing ‘all the external Advantages which contribute to form a shining Distinction on Earth’, and the couple’s prematurely deceased daughter Henrietta Anne ‘who lived long enough to justify all the fairest Hopes of a Mother.’ To one side of a large funerary urn are the lifesize figures of Lady Anne’s grieving husband and their young son clinging to his father in both terror and sorrow; the pair of them gaze up at the hovering form of an interceding angel. It is a remarkably theatrical piece of work, and must have been especially effective when seen by moonlight. The subsequent fortunes of the Dartrey Mausoleum have been mixed. At some date in the 19th century, the dome was taken, or fell, down and replaced with a shallow slated pyramidal roof, and the brick walls plastered. The last member of the Dawson family to live at Dartrey, Lady Edith Windham, eldest child of the second Earl of Dartrey, sold the estate in 1946 to the Irish Forestry Commission (now Coillte) which continues to own the land on which the mausoleum stands. Dawson’s Grove, rebuilt in the 1840s as Dartrey Castle, was demolished and the view across to Black Island obscured by dense planting of evergreen woodland. 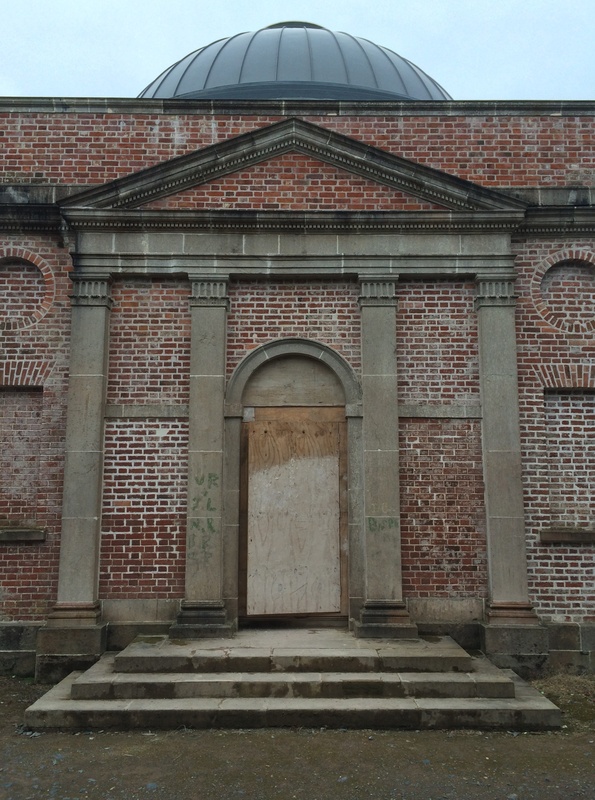 Meanwhile the mausoleum was left to languish and although the Irish Georgian Society undertook some repairs in the 1960s, the building succumbed to decay, its roof was lost and the sculptural group – as can be seen in photographs above – seriously vandalised. 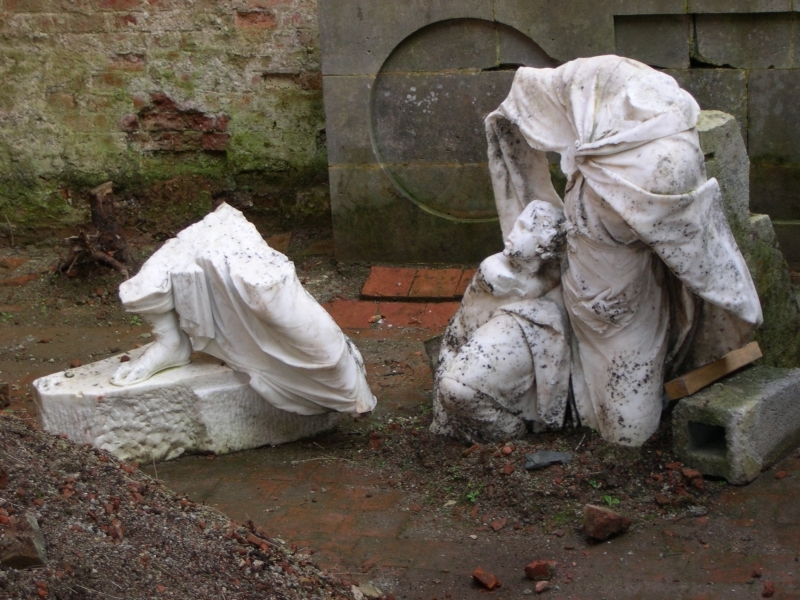 Such might have remained the case, had it not been for the energy, imagination and commitment of a local group, the Dartrey Heritage Association which over the past decade has steadily worked to ensure the restoration of this outstanding monument. Securing funding from a variety of sources, including the local County Council, the Heritage Council and once more the Irish Georgian Society, together with monies raised by other means, the DHA has now almost completed this project. The building is once more intact and with a domed roof, and inside the sculptural group has been repaired with missing sections scrupulously replaced. The entire project is a wonderful testament to what can be achievied by a local voluntary body with sufficient determination and persistence, and ought to serve as an example for others throughout the country. 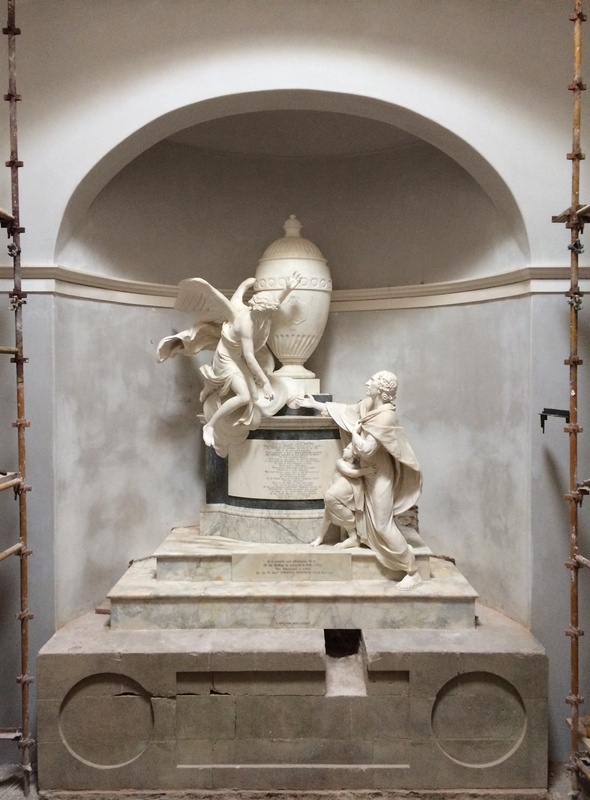 Above all the restoration of the Dartrey Mausoleum shows that nothing is beyond salvation, provided the will is there. This entry was posted in Architectural History, Country House, Irish Folly, Monaghan and tagged Architectural History, Architectural Restoration, County Monaghan, Dartrey Mausoleum, Georgian Architecture, Heritage at Risk. I saw the mausoleum,at least 30 years ago.What a transformation and good news for a change! I hope that all concerned with the restoration,are suitably pleased with themselves,as one could put it! I seem to remember a very beautiful stable yard as well? A wonderful project and a great achievement indeed. Dartrey house much have been absolutely beautiful and once again a terrible loss to our built heritage. This is an amazing effort as the last time I saw the statue (only a couple of years ago) it was in pieces with bits missing. Congratulations to the Dartrey Heritage Society for restoring this monument for posterity. Thank you for yours. I would urge you to pay another visit as the restoration is quite wonderful and deserves all our approbation and praise. I assume with your name that you are related to the family? The restoration and preservation of this monument warms my heart and gives great pride to my family in the United States. Thank you and congratulation to the Dartrey Heritage Society for all of your hard work, energy and effort!